St. Mary’s Food Bank distributes 250,000 meals a day to individuals struggling with hunger throughout Arizona. Accomplishing this task requires support from dedicated volunteers, food drive donors and community partners who provide financial support to help us alleviate the burden of hunger for families. One of our new community partners, Avilla Homes, partnered with St. Mary’s to host a donation campaign when celebrating the grand opening of their newest property, Avilla Palm Valley in Goodyear. 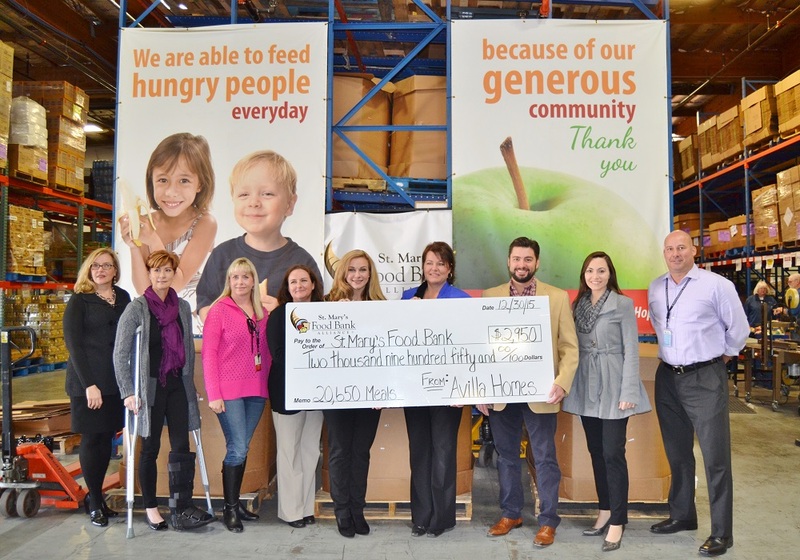 During the month of November, Avilla Homes reserved $150 for every new lease signed to St. Mary’s Food Bank. Today, representatives from Avilla Homes stopped by our Phoenix warehouse to present a check for the total donations collected – $2,950.00. The contribution will help us provide 20,650 meals to individuals and families who need it most. To learn more about Avilla Palm Valley, visit https://www.avillahomes.com/homes/avilla-palm-valley. Is your organization interested in partnering with St. Mary’s Food Bank? There are many ways to help – from volunteering to food drives to matching gifts and more. Learn how you can get involved by contacting Kerri Cole at kcole@firstfoodbank.org or visiting https://www.firstfoodbank.org/get-involved/corporate-opportunites.